The Honorable Paul Fannin belies the ubiquitous term, “politician.” He has never exhibited those particular characteristics that typically define the label, and is known for never equivocating on any issue of importance. His compassionate regard for the people he served and their basic human rights was well ahead of the curve on today’s popular stance for compassionate conservatism. Paul Jones Fannin, born in Ashland, Kentucky, was ten months old in 1910 when his parents settled in Phoenix. In 1912, his father, Thomas Newton Fannin, moved his family from the farm at 33rd Avenue and Thomas Road to 45 West Moreland, an address then on the outskirts of Phoenix. Paul went to Kenilworth Elementary School, Phoenix Union High, and the University of Arizona. He graduated from Stanford University in 1930 with an AB degree. His childhood friends included Bob and Barry Goldwater, Orme and Bob Lewis, Robert Creighton, Jack Williams, Harry Rosenzweig, and Kemper Marley, all legends in the annals of Phoenix history. Paul was taught by his mother Katherine Davis Fannin to worship God, love his country, and respect the rights of others. The lessons stood him well whether working on his father’s farm or later during the Depression when he helped out in the family hardware business after his college graduation. These experiences instilled a respect for financial responsibility and for fiscal conservatism in public service. He married Phoenix native Elma Addington in 1934. Paul enjoyed sports and pitched in organized softball when it was the most popular sport in Phoenix for both men and women. He also became a better-than-average golfer. After graduation from Stanford, Paul and his brother, Ernest, left the family hardware business to become partners in selling a new product, butane – propane gas. They were good salesmen, marketing their products through demonstration. The Fannins would leave a gas refrigerator connected to a butane-propane tank in a truck parked next to the kitchen door of a local farm family. After a few days, the convenience sold both the gas refrigerator and gas service to their prospective customer. Their products provided comfort to farm families and urban dwellers who lived beyond the city’s gas main lines. When the brothers sold their company in 1956, the Fannin Gas & Equipment Company was the largest liquid gas dealership in Arizona. Paul was known for his leadership in community organizations. They included the Chamber of Commerce, Thunderbirds, YMCA, the Business and Education Partnership, and the American Red Cross. Before his 1958 run for governor, he had never run for public office. He based his decision on his knowledge of Arizona and his belief that he could make a contribution toward the welfare and betterment of his state. As a Republican candidate, he knew it wouldn’t be an easy win. Voter registration favored Democrats about six to one. He won his bid and served three terms, despite majority footholds held by Democrats in the state legislature. 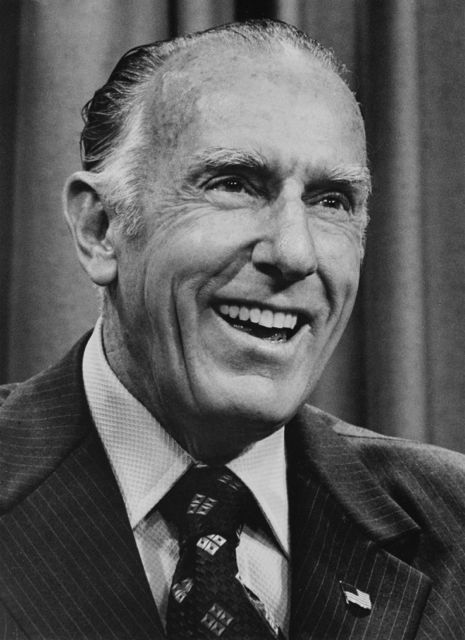 Because of a thorough understanding of economics, he began stringing together a list of notable achievements: leading the effort to create Arizona’s community college system, modernization of traffic laws, and increased aid to education that focused on helping physically and developmentally disabled children. He sponsored the Arizona-Mexico West Coast Trade Commission, which proved successful in attracting new industry to Arizona. Paul held office hours on afternoons in the Governor’s office, where any person without an appointment could express concerns. He often met with as many as forty Arizonans in a single afternoon. He ran for and won Barry Goldwater’s vacated Senate seat in 1964 and served two terms. He worked to protect right-to-work laws in Arizona and other states. Paul’s most significant role, however, may have been as leader of the floor fight to ensure passage of the Central Arizona Project. He worked jointly with the ailing, senior Arizona Senator, Carl Hayden. With his energy and extensive knowledge of the state, Paul led the battle onto the floor of the U. S. Senate for Arizona’s desperate need for more water. In 1968, Congress authorized construction of the CAP, considered the most important public works project in the history of Arizona’s water supply. Senator Paul Fannin received the National Captive Nations Eisenhower proclamation and medal: “. . . to further the pursuit of freedom and independence for all captive nations.” The Arizona Association of Realtors named him Citizen of the Year in 1981. The Arizona Chamber of Commerce presented him with the distinguished Arizona Heritage Award in 1995. He is past chairman of the Western Governors’ Conference and has served on many local, regional, and national advisory boards. Paul and Elma’s family includes three sons, Tom, Bob, and Bill, a daughter, Linda, ten grandchildren, and nine great-grandchildren.